It was fitting because Amendola and her Hornets teammates, along with a good portion of the community, can be considered superheroes for their support of the charitable endeavor. 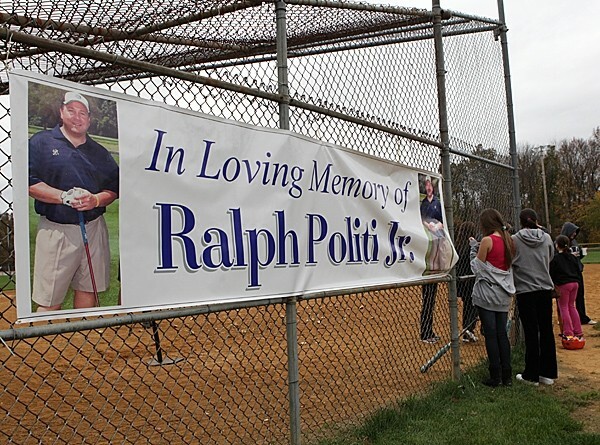 More than 100 people participated in the walk at Lurker Park on Sunday, Oct. 28 to honor the memory of Politi Jr. and to raise funds for Mothers Against Drunk Driving and the Hanover Park softball program. Politi Jr., only 49 years old, was struck and killed by an alleged drunk driver on May 5. "This shows how much everyone cares," Amendola said. "A lot of people came here today. It was great. It was so much fun. Everyone should be aware of MADD." Another senior, Nicole Fernicola, said that, through the event, which featured raffles, a disc jockey, pumpkin painting, massages, T-shirt sales and a food concession, she learned more about MADD. Fernicola is the Hornets' shortstop. "It's a very important cause," Fernicola said. "I didn't know a lot about MADD and it brought it to my attention." The twin daughters of Politi Jr., Danielle and Dana, and their softball teammates, led the walk. The registration fee for adults was $20 but many participants gave more. Hornets coach Kristen Hogan said that a good number of walkers donated in excess of $50. "The community does an excellent job of supporting us," Hogan said. "The parents helped out so much. It's good for the girls to think about drunk driving. With what happened to Ralph, we want to give to charity." Danielle Politi appreciated the show of support just one day before Hurricane Sandy hit New Jersey. She said she and her family are "doing the best they can" considering the tragic circumstances. The senior first baseman, sporting cheetah spots on the left side of her face, was glad that a portion of the proceeds raised will go to MAAD. "People have to realize that, by driving drunk, they don't just ruin their lives, they ruin the lives of others," Danielle Politi said. "It's not the person who drinks, drives and goes to jail. It's what they do to someone's loved ones." Besides the walk, one of the highlights of the day was hitting apples. They were originally going to bob for apples but decided to take some swings at them. Amendola thought Politi Jr., who coached many of the girls when they were younger, would've liked that. "I think he would've done it with us," Amendola said. On Sept. 24, a golf outing was held at Brooklake Country Club to benefit the DMP Education Fund, which was set up to help with the college educations of Politi Jr.'s daughters. He also was remembered with a garden and bench that were installed near the softball field at the high school.